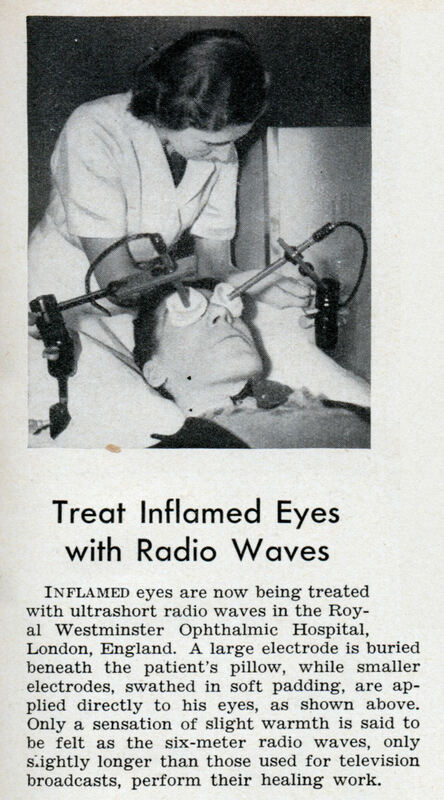 Inflamed eyes are now being treated with ultrashort radio waves in the Royal Westminster Ophthalmic Hospital, London, England. A large electrode is buried beneath the patient’s pillow, while smaller electrodes, swathed in soft padding, are applied directly to his eyes, as shown above. Only a sensation of slight warmth is said to be felt as the six-meter radio waves, only slightly longer than those used for television broadcasts, perform their healing work.